Spring is almost here – just 13 more days – and so we’re going to start showcasing all things spring for your wedding. And today we’re starting with this super cute flower cookies. I absolutely love how happy these flowers look with the combination of sunflowers and daisies (two of the cheeriest flowers out there). 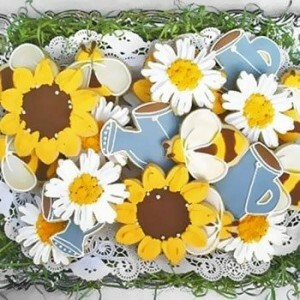 The watering can and bumblebee cookies are too cute. These cookies would be a lovely favor for your guests to take home from your spring wedding. You could place a plate of cookies at each table at the reception and encourage guests to take home a few (giving them each cute take home containers) or you could package them in clear bags tied with bright, springy ribbons. Either way you’ve got a cute and delicious spring-inspired favor for your wedding. The cookies are butter cookies with a hint of almond flavor and you can order a variety (which includes the flowers, bees, and watering cans) or you can request just one shape. The cookies come individually wrapped and you can request certain colors for the icing. You can find these cute cookies – along with five other design options – here.